My best christmas present ever. For a time as a kid, our family had barely middle class income. Oh, we never went without shoes or anything, but things were tight. During those difficult few years, there were a sprinkling of glorious moments when something so wonderful happened it felt like a miracle. One occurred when I was in grade 2. I’d just learned how to tell time and I wanted a watch for Christmas. Desperately. But I didn’t expect one, that’s for sure. On Christmas Eve (we followed the northern European tradition of opening presents Christmas Eve), there was a special box for me. It was an unforgettable moment, unwrapping that gift. 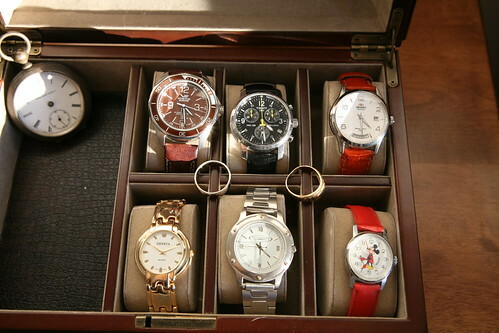 Not only did that box contain a watch, but it had six different coloured straps which could be interchanged, and three different casings which could be interchanged. The permutations and combinations were infinite to my 7 year old mind. Not only did I receive a beautiful watch, I received an infinite number of watches! And I wore a new one every week for that year, and I bet the year after that, and the year after that. Anyway, that’s one of my most magical, glorious moments of Christmas that I can recall. How ’bout you? Did you have any particularly thrilling gift-moments that you can recall? Giving to panhandlers. Christmas Thinking. All we want for Christmas is … love and belonging. 5 Last Minute Tips to Spend Smart between now and New Years. Gift shopping: love it? hate it? avoid it at all costs? Thanks for sharing Nancy! My group and I were talking about this subject a few days ago and it was amazing to hear everyone’s story and for a moment live within each person’s memory. It is a good reminder of what the holiday season is all about. My favorite present I received when I was ten. It was from my aunt and in the large box wrapped up in a baby quilt that had been my father’s and my aunt’s was the china doll that had been in my family for several generations. It was a gift that made me feel delight of being a child and grown up enough to be responsible to look after “Margret”. Over the years I have received many great presents and most of the great ones are not material items. But I can still remember the color of the wrapping paper, the blue quilted robe I was wearing that day and the feeling of holding that doll in my arms. I did not even open any other presents that day and it took a lot of coaxing for me to put her down to eat dinner that night. Wishing you a very Happy Christmas and All the best in 2011! Kat, what a sweet story. I can soooo imagine it! Do you know what ever happened to Margret? When I was about 10, my parents bought me a new bike for Christmas, and even though it was standing right there in the living room when all of us kids came down the stairs to open our presents on Christmas morning, I assumed it was for one of my older brothers and I walked right by it. I opened all my other presents and figured I was done, but my parents said,”there’s one more gift that you’ve overlooked.” I was totally floored, and for them it was the best surprise. Brad, that could be a Tim Horton’s commercial – it’s classic! A boy, a bike, and discovering that it was for *you*. I can imagine your parents big grins as you absorbed that the bike you’d walked right by was actually yours. I still have Margret, she is sitting on my Nana’s writing desk. I still get warm fuzzy feelings when I look at her and hold her. The best Christmas present I ever received was when I was 7, we found a puppy under our Christmas tree, with a tag saying her name was Mitzi. My nana & poppa had gone to buy a dog for themselves but when they saw the conditions, they bought Peppi & Mitzi. Of course, my parents were not happy, but what could they say. The best present ever, our constant companion and she lived to be 17 years old. Brandi – I got misty eyed (I *love* dogs). Did your parents become happy about it over time? What kind of dog was Mitzi? You must have been over the moon. My parents grew to love Mitzi, she was a totally sweet mixed breed chihuahua with a huge personality. Any doubts were quickly erased, everyone loved her and knew her by name in our neighbourhood.